Are you a woman, considering proposing to your partner? This idea may have been ludacris in years gone by, but these days, it’s actually something quite common. Not as common, but it does happen! This guide is going to help you out if it’s something you’re thinking about. Some people say women can only propose on a leap year (a tradition that apparently came from Ireland), but if this is something you want to do you shouldn’t let the time of year stop you. Whether you’re a female hoping to propose to her man or a woman proposing to another woman, this guide could give you a few handy tips. Read on and you might get some ideas! Read on if you want more information on how to navigate this and what to do. Enjoy! Will Your Partner Like A Proposal? The first thing to think about is whether your partner will actually like a proposal. Some men are more traditional, for example, and many may have a bruised ego or feel a little cheated if you do it before them. 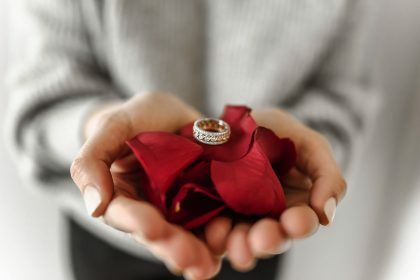 Hopefully, you will have discussed marriage beforehand so you know exactly how your partner feels about it before going ahead with a proposal. Plan a proposal that is totally unique to the two of you, if you decide you’re going to go through with it. Consider the location, date, and time, and try to make it so that these things mean something to the both of you. Listen to your intuition. How do you want your partner to feel? Try to create a moment designed to instill those feelings in your partner. Make sure you take the time to really think this over and decide whether it’s the right thing for you to do. If you’re not sure how they are going to react, give it some time. If they have told you they aren’t ready for marriage, it’s unlikely that a romantic proposal will just change their mind – no matter how epic it is. To Buy An Engagement Ring Or Not? Shock, horror: you don’t always have to buy an engagement ring when proposing. If you do decide to go the traditional ring route, there are tips you can check out to buy the right one. However, there are no hard and fast rules, and it might be that your partner isn’t really a ring person. In that case, think of something else you can propose with that could be equally as special. Some women have been known to propose with an engraved multi tool! LGBTQ women who are proposing to other women shouldn’t feel under pressure to purchase a ring if your partner isn’t the ring type either. What else could represent the promise of marriage to them? You don’t have to present anything, other than meaningful words, if that suits, but maybe you could go for a nice watch, or even a scrapbook that documents your relationship and what you mean to each other. So, when is the best time to drop your proposal? You could go for something lowkey, just the two of you if you are a woman proposing to a man – if you know they’re not going to like lots of attention, this is probably best. However, it’s totally down to you and your partner and your personalities. You know them best. It’s always nice to be caught a little off-guard when you are proposed to. Many people love the fact that it’s a romantic surprise. It’s a good idea to avoid times or events where a schedule could change. For example, what would you do if you had planned a romantic picnic, only for your partner to get called into work? These things do happen, so it’s important to think things through. It might be best to do it when you know you both have time off, perhaps on a weekend away or a full blown vacation. It might be common for people to propose during these times, but there’s good reason! Should You Let His Family Know? There’s an old tradition that says men should ask the bride’s father before proposing, to be sure that it’s ok and get permission. However, there’s no such ‘rule’ or tradition for women. You could still do something similar, if you wanted to, providing you think it makes sense and that their family aren’t going to blab to them and spoil the surprise. You need to do what you think is best. Maybe their family could help you to come up with the perfect proposal idea, and pick out something to present to them. If you want to keep this proposal low key and just between the two of you at the start, that’s perfectly fine and understandable too. You’re already breaking those outdated ‘rules’, so don’t be afraid to break a few more! It’s 2018, and women proposing is totally acceptable – whether you’re proposing to your man or your girlfriend. Take your time to plan a proposal that is unique to your relationship. You know your partner best, so consider the various times, locations, and things you could do to surprise them and delight them in equal measure. Listen to your gut. Is it telling you this is the right thing to do? You might be in conflict with yourself and unsure. Wait until you’re sure. You owe it yourself to give this some real thought so you know you’re doing the right thing. Get quiet and really feel it in your stomach – many say the stomach is like the second brain, and can really influence how we feel about something. Pay attention to it. If you decide that this is the right thing to do, have fun with it. Many women who decide to propose report feeling like a badass afterwards! Are you going to propose? Have you already proposed? Share your stories below and you never know who they might help. Thanks for reading! Previous PostPartner Post: Do You Need A Change Of Air This Winter?